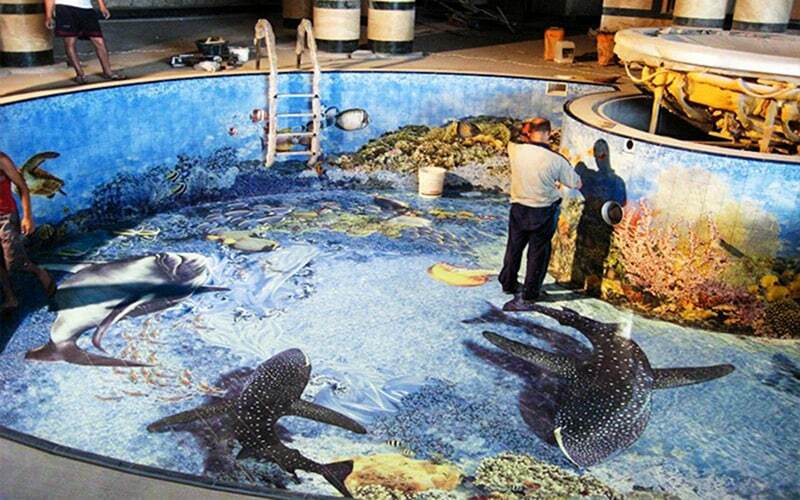 Tile murals are customised printed, handcrafted, and kiln fired ceramic or porcelain tiles. Can be of any size, unassembled for a bathroom, kitchen splashback, shower, swimming pool, decorative wall pieces as well as wall murals. Ceramic tile murals, as well as other decorative tile murals, are used for indoor or outdoor; they can be of various types and can be painted or printed. When the painted ceramic tiles and porcelain tiles are fired, they will add colour, unique beauty and charm to your house, boat or business. The ceramic tiles mural and accent tiles make beautiful back splashed and surrounded for bathroom, kitchens, patio, barbecue island as well as poolside areas. The popular design of tile murals includes various kinds of palm tree murals, seascape and landscape murals, tropical and lighthouse murals, coral reef and marine life tile murals. Virtually anything that you desire can be created. Decorative tile murals can be found in homes, churches, government buildings as well as business. They are in the form of large-scale and the earliest forms are referred to as mural which is also known as cave paintings. These works are usually commissioned in most cases, but the pictures are now done on tile murals or canvas rather than walls and ceilings. They are also a popular choice of home decoration. We can likewise say that the decorative tiles mural are one of the oldest forms of art and they are well documented around the world. In the olden days, tile murals were rock and cave paintings as well as carvings. After that, the artwork which was left by South Americans and ancient Egyptians can be seen inside buildings. These tile mural reveal the religious themes as well as everyday life. Also in the middle ages, the rise of the church showed its power and riches with commissioned work of art which shows biblical images. The most popular of these include Creation inside the Sistine Chapel and Michelangelo’s famous Last Judgment. In the 19th and 20th century, ceramic tile murals were used as a form of advertisement and also gained commercial interest. Technology later began making advancement in the 1970s as murals are being produced in mass on wallpaper, tiles and canvass. These tile murals came with photographic life-sized images which have a natural look inside the living room. Then with the development of faux painting that started in the early 1990s, people that are fascinated by them started inviting painters to visit their home to design ceramic tile murals. Indoor porcelain ceramic tile murals can have different kinds of outdoor appearance; the design can include turning a room into a jungle, mountaintop or Roman bath. The rest of the home can be made to harmonize with the colour and furnishing with the aid of ceramic tile murals. This is mostly used by restaurants to create a theme inside and outside. This is commonly seen whenever one visit a Mexican restaurant which gives an appearance of walking through and sitting in a Mexican village. When you choose the right tiles for your house, it will allow you to personalise your bathroom and also make it an essential part of your home. If you have taken time to look at photos of kitchen splashback tile murals in magazines or online, then you know how long a change like this can completely transform the aesthetics of the room. Nowadays, the decorative splashback has become very popular regardless of the style and size of the room. 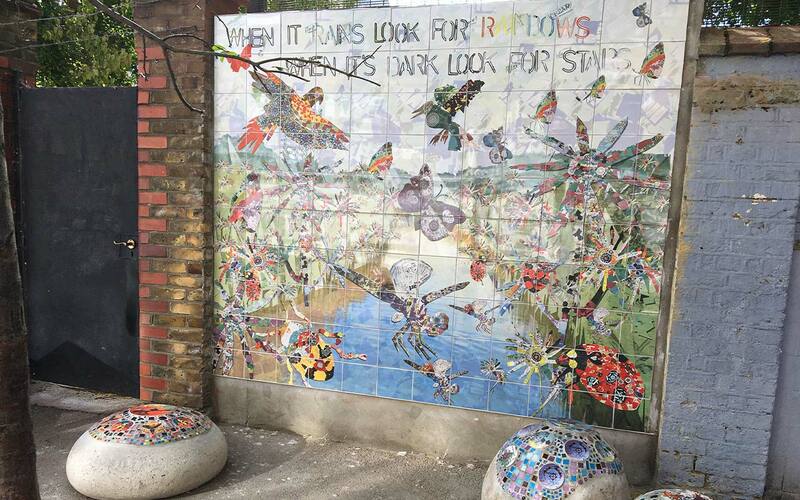 The outstanding thing about these tile murals UK is that they can be made with various kinds of materials which include copper, tin, glass, stainless steel, glass, natural stone, ceramic as well as mosaic tile. With the aid of kitchen splashback, you can easily create a gentle look, perhaps something which is designed with muted colours as well as understated design. However, you can also create an elaborate design. This kind of design can be landscaping, a specific city or country scene, or even a geometric pattern. The material used as well as the complexity will determine whether the project can be completed by you or you will require the assistance of professional to do the installation. Some of the fascinating patterns are made with ceramic tile, but there are various ideas which can be used to create tiles mural. Nowadays, there are some people that prefer the use of a single material, thereby creating murals by making use of different colours. However, materials can be mix and match to create an interesting design. The essential thing when planning for the creation of the splashbacks is careful planning. This is because there are some materials which are easy to work with for this kind of project while other are complicated. Once you know this earlier, you will be able to create your desired look and thus save a lot of time money as well as effort. After all, you aim to ensure the finished look is outstanding and this can be accomplished by making the right choice. You can also contact your local home improvement store to ask about weekend classes about the installation of kitchen splashback tile murals. Majority of these companies provide training classes to teach homeowners how to complete projects that would look great and also add value to your property. Each tile murals can be hand-painted according to your specifications. The best part about tile murals is that it can be customised to any dimension; this implies that the painting can be made smaller or bigger to fit a particular place where you want it to be. All the decorative tiles, tile paintings as well as art tiles are kiln fired and permanent, meaning that they will not rub off, fade, wash off or be affected by heat, splashing of hot liquids or foods from the stove, sink or moisture from the shower or bath. 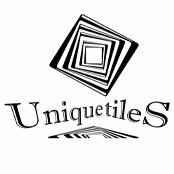 Tile Murals are of various brands, but there are several contemporary artists who will provide an authentic and unique mural design to their clients. So whenever you want to design your home thinks of murals and broadens your imagination. What Are Bathroom Tile Murals? The bathroom is one of the rooms in the house which is difficult to decorate; you will find this to be hard if you are not involved with the design when it was constructed. Bathroom tile murals will, however, give your bathroom the decoration it truly deserves. A bathroom is a calm, relaxing place which is used every day. The decoration should be appealing to your family because they are the ones that usually see it but you must also ensure that you enjoy the decorations. This is because you will want to relax when taking a bath or shower, and not think about why you should change the decoration of the bathroom. If you are not familiar with bathroom tile murals, it is something that everyone will find appealing regardless of who they are. It is the artworks which are made from wall tiles. The tiles are then placed on the wall in an ordered manner to form a design or an image across the wall. In most cases, the walls surrounding the shower are tiles, and this is where your tile murals would be placed. There are various designs of tiles murals, from abstract artwork to simple plain colour design. With the aid of tile murals, you can easily change a boring white room to a wonderful work of art. With the aid of tile murals, you can also change an abnormal bathroom space into the relaxing area of your house. There are some tile murals which are available in painted artwork and will also have a unique look to everyone that visit you. Various scenic paintings which can be chosen include animals in the woods or a calm sunset on the beach. Any style of bathroom tile murals imaginable can be produced for your bathroom. However, it is advisable to choose something you will enjoy to look at because you are the one that sees it every time. You do not need to worry about water damage or fading on your bathroom tile murals because they do not fade out or get damaged. The design as well as the image you choose will always be the true colour and won’t fade out like other kinds of decorations which need to be replaced often and often. A tile mural will give your bathroom a unique look which will be pleasant to the eye. One of the most frequently visited rooms in the home and one which people will spend time in is the bathroom. The family members make use of the bathroom on a daily basis, and guest and visitors may likewise request to use the bathroom. If you have multiple bathrooms in your house, complementary designs for the tiles can be chosen for the bathroom to become unique. So try to make a difference and don’t limit yourself to white tiles or another plain colour. Ensure you use decorative tile murals or create patterns with different coloured tiles. You can create a formal design for your guest bathroom, create a funny design in the kids’ bathroom to brighten it up and then personalise your bathroom to your taste. Ceramic tiles murals can be used to personalise your bathroom tile design or a shower tile design. They are usually available in various sizes made with either twelve or twenty-four-inch tiles. What makes them crucial for personalising your bespoke bathroom tile design is that there are several designs which you can choose from and if you do not like the ones which are available, you can request for a custom made. They are durable, easy to clean with damp sponge and look fabulous and would also be a great focal point for your bathroom or the design of shower tile. Co-ordinate with a shower curtain in the same theme, and you have an instant unique as well as personal bathroom design. If your passion is an owl, horses, Van Gogh, flowers, dolphins, rural scenes, architecture or any other thing, you can easily design with tile murals. The various kinds of the tile murals include painted tile murals as well as printed tiles murals. The painted tile murals are those in which the surface of the tile is hand painted. The basis of the design to be painted on the wall is pre-determined. This design can be created on ceramic leaves or in clay before the actual murals are created on the wall. The painted murals are very popular for children; this is because they find themselves involved in the whole process, right from conceptualisation of the theme, to the manufacturing as well as assembling. The parent likewise prefers painted murals because it relieves them from the worry that accompanies their children occupying the ground space. The tile murals are firstly painted on the tiles and then fixed on the wall surface. The tile murals have the quality of making a dull, cold place look very attractive as well as interesting; this cannot be achieved with ordinary kitchen or bathroom tiles. The tiles are cut into a design based on the plan. These murals can be small, big and give a new look to the room as well as the exteriors. Tile murals are made of mosaic, tiles, mirror as well as ceramic pieces. They likewise portray artistic and creative skills. The ceramic designs are firstly made of clay and then fire in a kiln. These murals are long and are generally inspired by canvasses. Additionally, climbing walls as well as traversing wall are other forms of wall murals. Tile Murals lend they’re colourful as well as the beautiful ambience of kitchen, bathroom or swimming pool.